A selection of documents recovered during the raid on Usama bin Ladin’s compound was released by the Office of the Director of National Intelligence on May 20. I decided to peruse it for fannish interest because you never know. Did anybody suspect Saddam Hussein collected Rowena Morrill paintings before they inventoried his townhouses? And bingo! There was one item listed among the “English language books”. 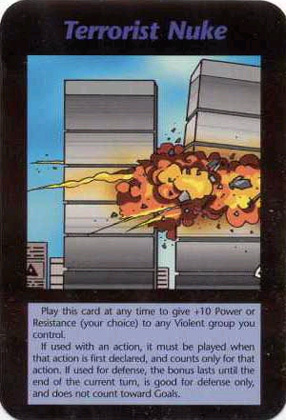 The Cuttingedge.org Website, a site devoted to providing ‘spiritual insights’ into the ‘New World Order,’ claims that Steve Jackson Games’ Illuminati New World Order card game foretold the attacks on the World Trade Center and the Pentagon on 9/11. It claims that cards in the game also predict future events. The writer believes that Jackson’s advance knowledge of future events was so dangerous to the illuminati conspirators that the Secret Service raided Jackson’s offices in 1990 to prevent him from revealing the truth (the Secret Service actually conducted the raid searching for information on a hacker, a case that was ultimately thrown out of court). I’m willing to bet Steve Jackson feels it’s entirely appropriate that an article about an Illuminati-themed game would be found at the final stop in the hunt for bin Ladin. This entry was posted in Skiffy and tagged Steve Jackson by Mike Glyer. Bookmark the permalink. Also: “Black Box Voting, Ballot Tampering in the 21st Century by Bev Harris”. And “Arabic language tutorial for violent jihadist extremists on how to use Google”, I guess because violent jihadist extremists use Google differently from the rest of us (probably more violently and extremely). Morris Keesan: Well, I thought it would have been a stretch to include the game manual for that Delta Force game. But you are willing to stretch much farther, I see! Mike, I’m a little more flexible than you, besides stretching in a different direction. I thought the bit about the Google instructions was interesting, although without any particular fannish relevance. I wonder if Usama ever commented on Bevs article on her web site. I know I did, and wonder if any of the other comments I read at the time were his, or if he read what I wrote. Strange to contemplate our lives crossing in such an obscure fashion. I think it would indeed be safe to say that my boss would be amused by this news nugget. The cuttingedge.org page to which the ICV2 article refers would appear to be this one, “SMOKING GUN” PROOF THAT ILLUMINATI PLAN TO ATTACK ON 9/11 AND BEYOND WAS WELL KNOWN AS FAR BACK AS 1995! Still available, and a fine tribute to the staying power of nonsense on the Web. I have seen so many videos on YouTube full of misinformation about the idiotic raid on Steve Jackson Games…some don’t even have the idiotic agency right (claiming it was the FBI instead of the Secret Service). And all of them think the Illuminati game was a coded release of information of planned events to come. It’s become part of modern American folklore, particularly with apocalyptic cultists and/or fear-mongers. The only real-world complaint I ever read of the game which made sense was Robert Anton Wilson’s, that he didn’t get royalties from the game’s sales even though he evidently thought his and Robert Shea’s Illuminatus! was a direct inspiration for it. The funny thing is, we still get a couple of emails per week from people trying to join the Illuminati. In my five-plus years fielding those, I cannot think of a single example that was not grammatically atrocious (“plz i want to join tell me how” and the like). I mean, suppose we were an organization that controls the world – why would we accept that kind of application? Wouldn’t we demand basic literacy at a bare minimum? I generally treat those emails as spam and delete them after a sad sigh (or chuckle, depending on mood). Feh. I’ve been playing “Illuminati” since 1984 (Only just realized the Orwellian significance of *that*). Wasn’t the raid about the “Hacker” game anyway? I remember thinking it was moronic at the time. The funny thing is, we still get a couple of emails per week from people trying to join the Illuminati. Oh, I meant to add – the conspiracy nuts apparently forget all about the 1993 car bomb attack when they claim that the “Terrorist Nuke” card foretells 9/11. Whenever a new Illuminati expansion comes out, it features cards that reflect current events and/or people. It’s a game set in the real world, after all, and satire is nothing if not timely. Terrorist car bomb goes off as the cards are being designed, put a terrorist nuke in the game. No prophecy involved. Oh, and the 1990 raid was over GURPS Cyberpunk, not Hacker. Fun fact: That raid and the company’s reaction to it are how the EFF got started! I suppose this is one of those benefits of actually joining online communities. So (cough, ahem) squee, m’kay? On a radio talk show, Robert Anton Wilson was accused of being the Head of the Illuminati. He demurred, saying that at most he was a Big Toe. You might consider a canned direct reply pointing them to where they can print out a Discordian Pope card for themselves…or a canned reply giving them honorary membership in “The Rand, Branden, and Holy Galt Church”, designed for those who are dogmatic about rationality. I don’t reply at all. Seems like the safest option; I think any sort of feedback would encourage them.